DO NOT OVERPACK. One medium bag should be sufficient, along with a carry-on large enough to carry at least a days worth of clothing and gear. If you need something, you can always get it cheap in Bangkok. We will be traveling by van from Bangkok to Kalasin to Chiang Mai and back to Bangkok, and there isn’t a lot of cargo room. If you have two large suitcases, your van mates will not be happy. A lot of participants in previous trips did a fair amount of shopping. This is another advantage of packing only one bag; you can fly back the bag previously filled with donations instead filled with souvenirs and gifts. If this is something you may do, you might want to pack a lightweight duffel bag into your first bag. You can also purchase a bag in Thailand to bring back with you. If you don’t plan on bringing back 50 lbs of stuff, you can split a bag with one of your trip mates. You aren’t going to have to lug your luggage long distances, so you don’t need anything fancy. I personally use a Meridian wheeled convertible backpack, but I haven’t had to use the backpack feature in Thailand yet. Plus, you don’t need anything this expensive; I chose to invest in a nicer bag, because I travel to Asia and Africa once or twice a year. But do make sure you have something wheeled; it’ll make things a lot more convenient, particularly in airports. Wheeled duffel bags are also nice, but really, anything medium sized with wheels is okay. Some students choose to bring an expedition backpack. That’s fine, as long as you feel comfortable carrying it around. For our stay in the second village, we will be traveling via small pickup trucks over some rough roads. Therefore, we will NOT be able to bring everything. We will have to pack a separate, smaller bag with just what we need for this village. What we’ve done in the past is have students use carry-on bags or share a large bag between two people. Just keep this in mind for the trip. Domestic flights now almost always charge for checked baggage, usually $25 for the first bag, and more for the second one. Of course, flying out of Salt Lake City, we all have one domestic connecting flight to San Francisco or Los Angeles. However, domestic flights must honor international requirements if the flight is a connection for an international flight. We therefore do not have to pay for checking bags. In fact, they have to allow us two bags at 50 lbs. each. A word of warning: if your layover is more than a day or so, the domestic airline may not honor the international limits. So keep that in mind if you had plans to stay in any of the connecting cities on future journeys. Plan on carrying valuables, a day’s worth of clothing, prescription drugs, passports, wallets, jewelry, cameras, iPods and anything that you absolutely cannot get along with for a day in your carry on. Bags do get lost, and it’s pretty depressing to not have at least a change of clothing handy. Most of these situations resolve themselves within 24-48 hours, luckily. Also, most airlines will offer you some cash for the inconvenience. This is from personal experience (during a trip in summer, 2005, Korean Air kept our bags in Seoul instead of putting it on the flight to Bangkok; it could have been worse, since it at least stayed in the same continent, and we got them within 48 hours). You can get toiletries in Bangkok, so don’t worry too much about that. 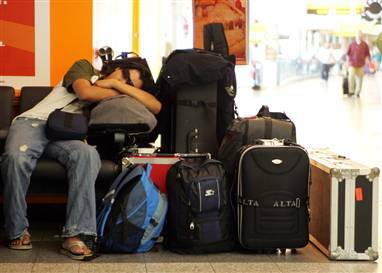 Airlines are getting stricter about the size of carry-on luggage. Hong Kong Airlines allows one carry-on piece that measures a total of 45″, with a maximum of 15 lbs. But then they also allow 2 bags of personal items such as laptops, purses, etc. I’ve carried a carry on plus a laptop bag with no problems, but other times, they get picky, and will weigh your carry-on. If they determine it is oversized, they will check the luggage, and if it exceeds the checked bag limits, they will charge you. ALL STUDENTS ARE RESPONSIBLE FOR ANY BAGGAGE FEES INCURRED DUE TO OVERWEIGHT OR OVERSIZED BAGS!! Don’t lock checked bags with a lock not approved by TSA, unless you want the locks broken. Make sure if you use a lock, it is a TSA approved one. Federal regulations. REI often has big sales, and you can get 20% off on one full-priced item, so if you don’t have a bag, it’s a good time to get one. If you plan on a lot of international travel, and plan on “roughing it” (e.g. 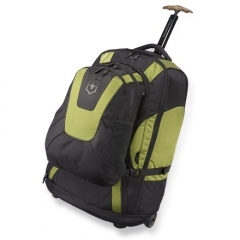 not staying in resorts or five-star hotels with bellhops and limos), a good wheeled backpack is a nice investment. The newer wheeled backpacks have surprisingly comfortable suspension systems, and are quite comfortable to backpack with, even longer distances. Plus, many of them have smaller packs that detach, making it perfect for a day pack. And the wheels are invaluable when your navigating a large Asian airport or the streets of Bangkok, Nairobi or Phnom Penh.